On the south side of Lapland Bay, the park-forests of Velika and Mala Petka hills provide a wonderful running opportunity among Aleppo pines and Mediterranean shrubs. 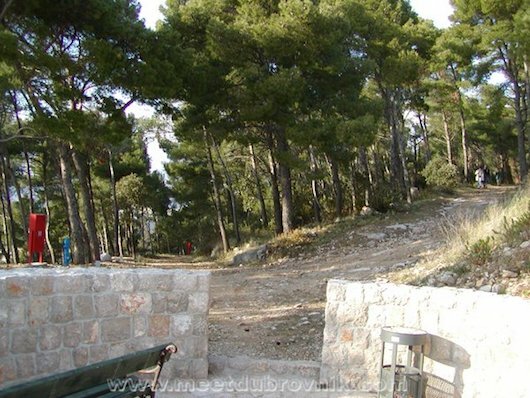 The paths on Mala Petka hill are gravel and more rugged, while the Velika Petka has a paved path that leads to the top. There are fantastic views of the bay and nearby cliffs. In all, the hilly, well-marked trails are about 3 km (2 miles). There’s good access from the numerous hotels in the area: Hotel Vis, Grand Park, Uvala on the north; and Dubrovnik Palace in the west. For a longer run, we recommend the wonderful path that runs along the water from the Dubrovnik Palace, on the western side of the forest park, heading north to the Dubrovnik President Hotel, about 3 km. Also can combine with our Babin Kuk loop.